OFFER EXTENED - 1 DAY LEFT! 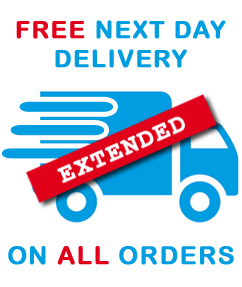 Due to its popularity we have extended our FREE DELIVERY offer - This will end at 5pm. Don't miss out - Order Now! This offer is also available for orders placed over the phone. This offer can be extended, changed or removed without notice. For full terms and conditions, please see our terms and conditions page. The goods are excellent and the time that it took from order to delivery was excellent. Order over £50 before VAT and carriage and you will automatically qualify for free delivery. Also, order before 4:30pm and all stocked items will be shipped next working day for free! If the chat box is not visible please visit our contact us page or call 0808 1699 149 during office hours. © 2019. justworkgloves.co.uk - Value Products Ltd. Registration Number: 03038023. VAT Number: GB 927 4801 12.